Cook noodles following packet directions until tender. Drain and keep warm. Combine hoisin sauce, honey and rice wine vinegar in a jug. Set aside. Heat 1 tablespoon oil in a wok over high heat. Stir-fry pork in small batches for 2-3 minutes, adding extra oil to wok if necessary, until evenly browned. Transfer to a bowl. Heat remaining 1 tablespoon oil in the wok over high heat. Add green onions, carrot, capsicum and broccolini. Stir-fry for 2 minutes. Add 2 tablespoons of water, cover and cook for 1-2 minutes until broccolini is vibrant and just tender. Return pork to wok and add hoisin sauce mixture. Stir-fry for 2 minutes or until pork is just cooked through. 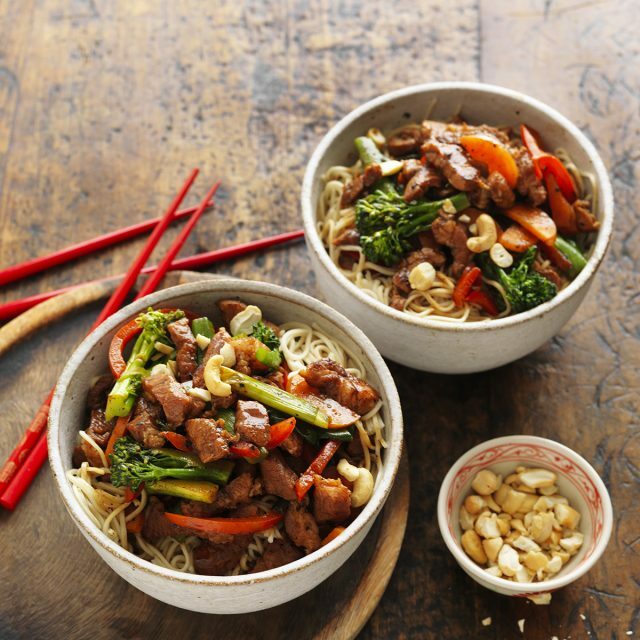 Serve with noodles and chopped cashews.